The cruise is coming to a close. Looking back at my three experiences with NOAA, hydrography (mapping the ocean), fisheries lab work, or shark and snapper surveys, I couldn’t decide which was my favorite. Like the facets of a diamond, each experience gave me another perspective on our one world ocean. Just like different geographic locations and work, each shark species give me a lens through which I can appreciate the mysteries of the ocean. Every day, I held, measured, kissed, or released a different species of shark. In the Gulf of Mexico, there are 44 shark species frequently caught. Fortunately, I saw quite a few, and will share some, in the order in which I met them. Our first night fishing, we caught many Atlantic sharpnose sharks (Rhizoprionodon terraenovae). They are named for their long flat snout and sharp nose. It seemed whenever we caught one, a bunch more followed. They were abundant and kept us busy. Paul Felts, Fisheries Biologist, records measurements while Kevin Rademacher, Fisheries Biologist, wrestles and measures the shark. Matt Ellis, NOAA Science Writer, took amazing pictures throughout the cruise. Day two, we caught a deep water Cuban dogfish (Squalus cubensis). The Cuban dogfish’s huge iridescent eyes were entrancing. Within a couple days of catching the Cuban dogfish, we caught another shark with iridescent eyes. It turns out this similar looking shark was not a Cuban dogfish, but a rare roughskin spiny dogfish (Cirrhigaleus asper). Dr. Trey Driggers, Field Party Chief, and prolific shark researcher, surprised us all when he reported this was the first roughskin spiny dogfish he had ever caught! The beautifully mottled, sleek, immature tiger shark (Galeocerdo cuvier) caught on September 23 had remarkable skin patterns that apparently fade as the shark ages. Adult sharks can get as large as 18 feet and 2,000 pounds. 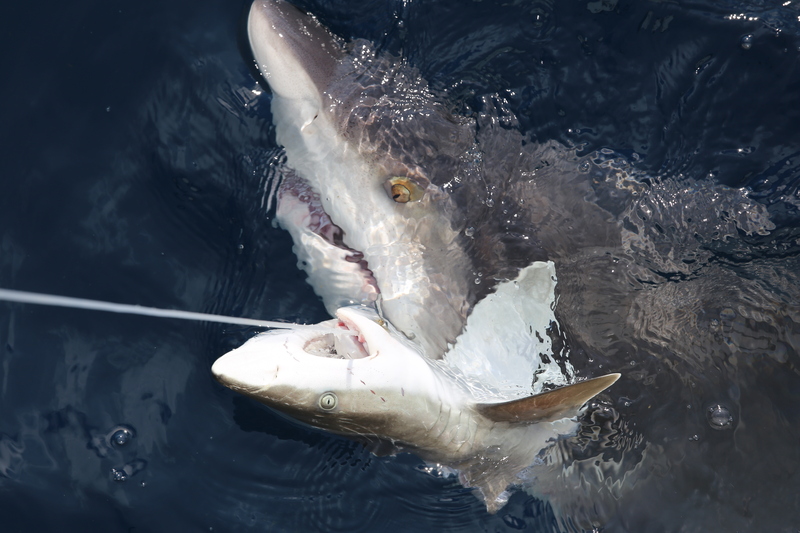 Along with the bull shark, it is one of the top three species implicated in unprovoked, fatal attacks worldwide. 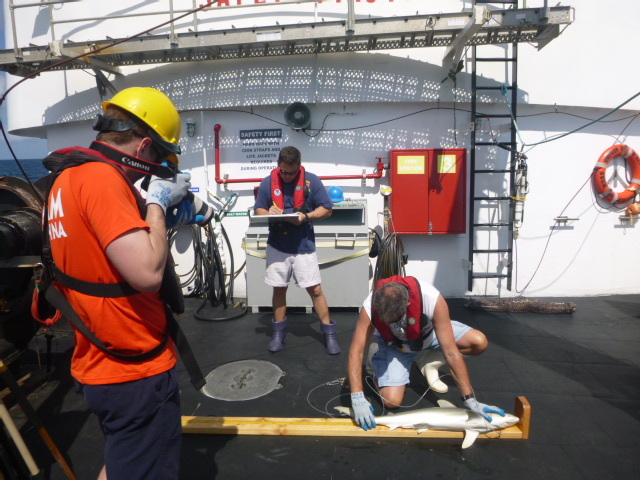 September 24 we caught a fascinating scalloped hammerhead (Sphyrna lewini). The flat extended head of this hammerhead is wavy, giving it the “scalloped” part of its name. Its populations in the Gulf have drastically decreased since 1981, making it a species of concern. 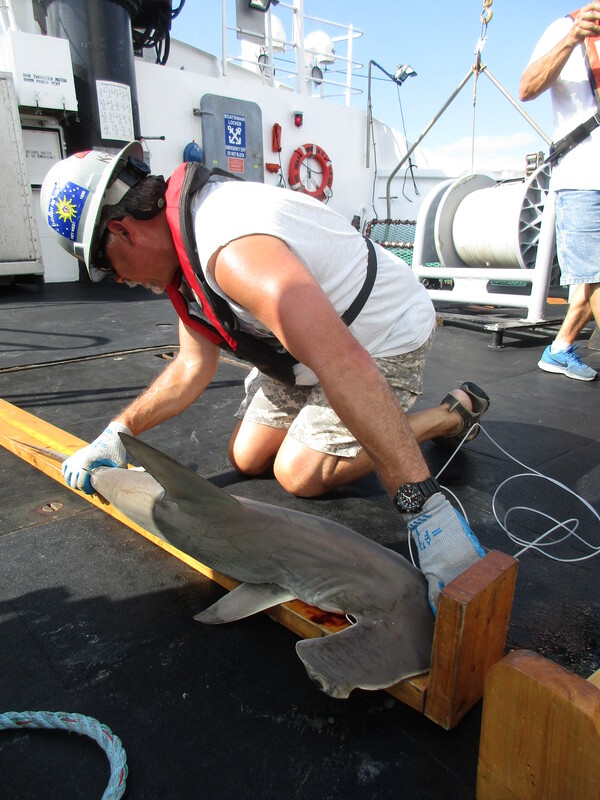 Here, Kevin measures one of several scalloped hammerhead sharks we caught on Leg IV of the survey. 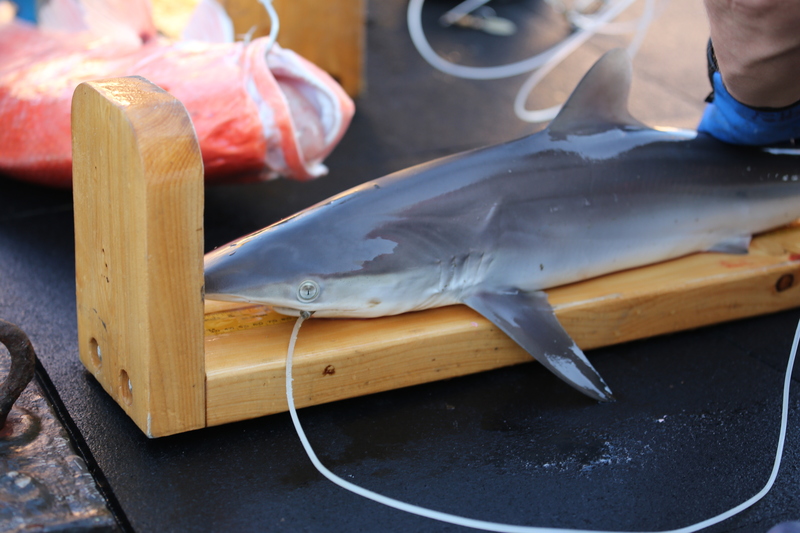 We also caught a silky shark (Carcharhinus falciformis). Like other Carcharhinus sharks, the silky shark has a sharp “Carchar,” nose “hinus” (Greek derivation), but also has a silky appearance due to its closely spaced dermal denticles. 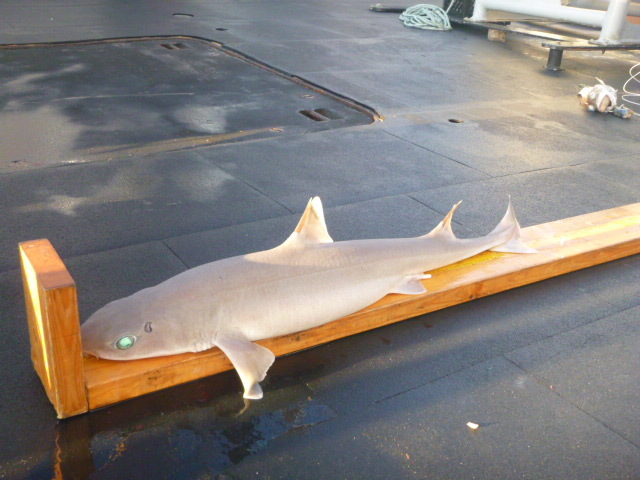 We saw two of the three smoothhound species present in the Gulf. 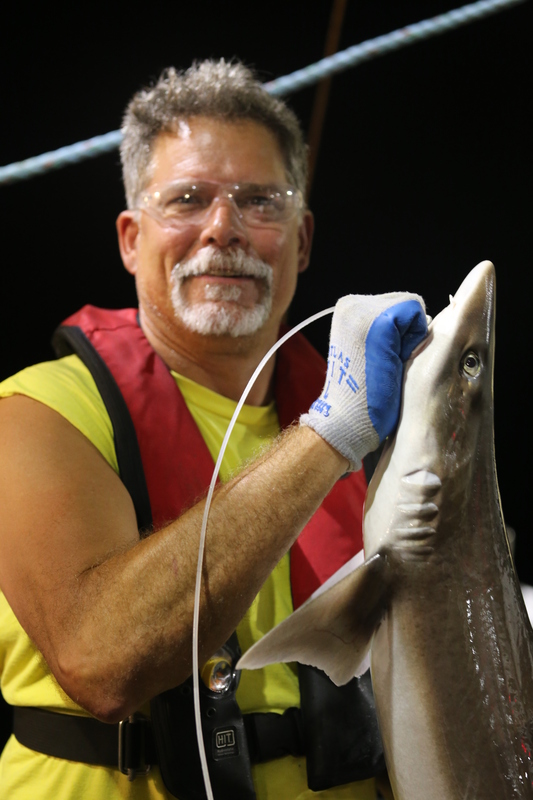 On September 25, we caught a Gulf smoothhound, (Mustelus sinusmexicanus), a species named less than 20 years ago. Much is left to learn about the ecology and biology of this recently discovered shark. Then, I watched the night crew catch, measure and tag a dusky shark (Carcharhinus obscurus). 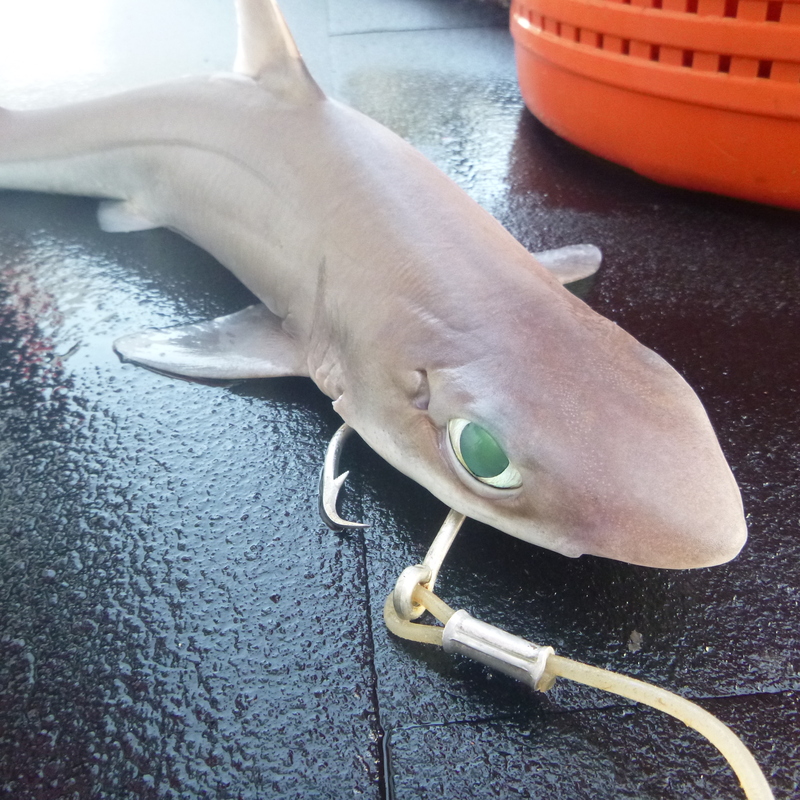 On September 26, we caught a sandbar shark (Carcharhinus plumbeus). Despite its size, the sandbar shark poses little threat to man. Due to over-fishing, sandbar shark populations are said to have dropped by as much as 2/3 between the 1970’s and the 1990’s. They are now making a comeback, whether it be from fishing regulations, or the decreased populations of larger sharks feeding on juvenile sandbar sharks. We tagged many sharks during my two weeks on the Oregon II. If you never catch one of those sharks again, the tag doesn’t mean anything. 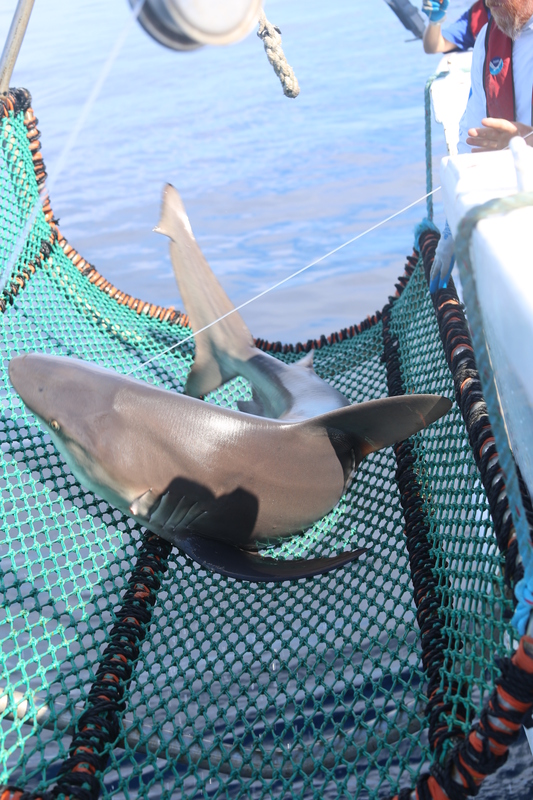 But this week, we also caught a previously tagged sandbar shark! Recapturing a wild marine animal is phenomenal. You can learn about its migration patterns, statistically estimate population sizes, and learn much more. The many years of NOAA’s work with this species in particular demonstrates that thoughtful, long term management of a species works. On September 27, we almost caught a nurse shark (Ginglymostoma cirratum). The barbels coming from its mouth reminded me of a catfish or exotic man with a mustache. Today, September 29, was our last day of fishing, a bittersweet day for me. That nurse shark that got away, or more likely, another one like it, came up in our cradle. Every day we caught sharks, including a few other species not mentioned here. Only once our line came back without a fish. The diverse characteristics and adaptations that allow each of these species to survive in a challenging marine environment inspire biologists as they try to categorize and understand the species they research. While catching so many different species of sharks gives me hope, many members of the crew reminisce about times gone by when fish were more abundant than they are now. I am the kind of person who always struggles to return from an adventure. I have learned so much, I don’t want to leave. Yet I know my class at South Prairie is waiting patiently for my return. I hope to share these many marine species with my class so that we all may view every moment with curiosity and amazement. 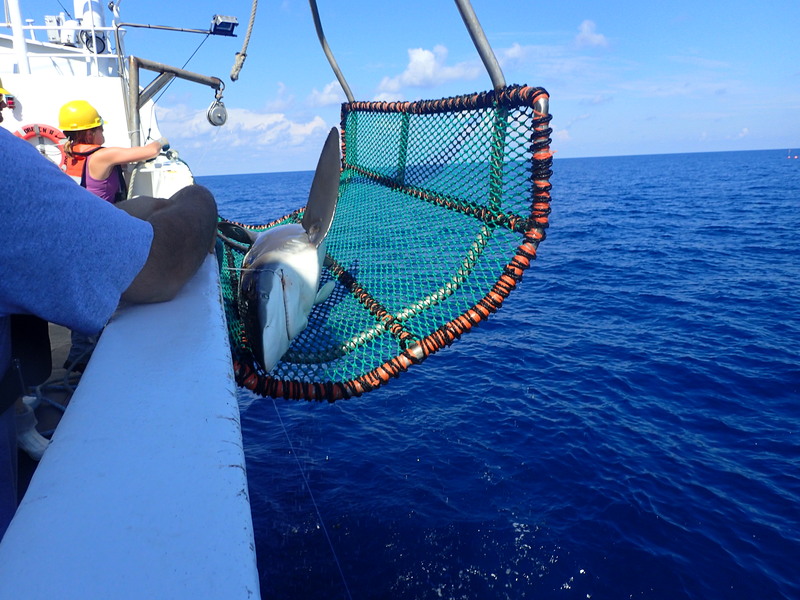 This entry was posted in 2016, Denise Harrington 2016, Denise Harrington Sept 2016, NOAA Teacher at Sea and tagged bull shark, Gulf of Mexico, longline, NOAA Ship Oregon II, sandbar shark, shark survey, sharks, sharpnose shark. Bookmark the permalink. Is finning -catching sharks just for their fins to use in soup – a problem in the gulf? NOAA and others are doing what they can to sustainably manage fisheries and prevent this harmful practice. You can help too by educating others.